A herniated disc (also referred to as a “bulging,” “ruptured,” or “slipped” disc) is a common problem that often causes sufferers to experience pain, weakness, or numbness in various parts of the body. Luckily, those suffering from a herniated disc in the Reno, Nevada area can rely on the team of orthopedic doctors at Tahoe Fracture & Orthopedic Medical Clinic to treat their condition and attempt to relieve their pain. A herniated disc causes pain when leakage from the disc irritates an adjacent nerve. A healthy disc is spongy and helps to cushion the vertebrae in your back. When the disc’s tough exterior is torn (either through gradual deterioration or injury), however, the jelly-like material inside leaks out of the disc and onto the surrounding nerves, causing pain to radiate down the nerves and into other areas of the body. 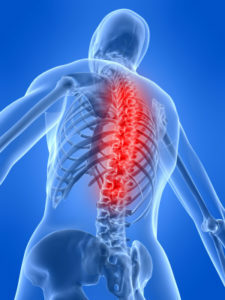 While herniated discs may occur in the cervical spine (neck) or thoracic spine (upper back), they most often occur in the lumbar spine (lower back). A herniated disc in the lower back commonly causes buttock and leg pain that radiates down the patient’s sciatic nerve through the thigh, calf, and foot (also referred to as “sciatica”). Patients with a herniated disc in this area of the spine may experience weakness in their ankles, or when raising their big toes or standing on their toes. They may also experience numbness and pain in various parts of their feet. Patients with a herniated disc in their neck may experience pain in their shoulders, arms, and hands, particularly when they cough, sneeze, or move in a certain way. These patients may also suffer from weakness in their deltoid muscles, their bicep muscles, their triceps muscles, and their wrist extensor muscles, and may have trouble gripping with their hands. Although patients with a herniated disc in their upper back rarely experience pain, those who do suffer from it tend to feel pain in their upper back or chest. Discectomy: By performing a discectomy, we can either partially or entirely remove the herniated disc, thereby relieving pressure on the pinched nerve and reducing the resulting pain. Artificial Disc Replacement: For those patients who need to have the entire disc removed, we offer the option of replacing the disc with an artificial one in order to restore spinal stability and flexibility. Spinal Fusion: After removing a badly damaged disc, we can implant a bone graft between neighboring vertebral bodies to fuse the disc space and stabilize the spinal column. If you are in the Reno, NV area and are seeking relief from the symptoms of a herniated disc, please contact Tahoe Fracture & Orthopedic Medical Clinic so that we may discuss treatment options that are designed to help relieve your pain and restore your function, mobility, and quality of life.